MORE than usual interest attaches to the new D.H. 29 monoplane which has just been finished at the Stag Lane works of the de Havilland Aircraft Co., not only on account of the fact that ДальшеMore>>> it is the first commercial aeroplane designed and built in this country to employ wings of the cantilever type, but also by reason of the many novel features incorporated in the design, quite apart from the internally braced wings. We think that we are correct in stating that when Captain de Havilland decided upon laying down the first of these machines, he had quite an open mind on the subject of cantilever wings. In certain quarters the cantilever wing has been dismissed with the off-hand remark that "there is nothing in it." By others it has come to be looked upon as the solution of all troubles, "a sort of blessed word, something like Mesopotamia," as Mr. J. P. North said at the air conference last year. As is usual in these cases, the truth is probably somewhere between the two extremes. It would appear that Captain de Havilland still retains an open mind on the subject, since his next commercial machine (first described in FLIGHT last week) is to be a biplane. This fact should not, however, be taken as an indication that de Havilland has met with disappointment in the monoplane. Far from it. As far as can be seen at present, the monoplane has justified itself, although until searching tests have been made it is too early to say whether or not it is an unqualified success. As the first of the monoplanes is now at Martlesham undergoing Air Ministry tests, official performance figures should be available before long. It should be remembered, however, that even if these prove as good as one has every justification for expecting they will be, there are other factors, apart from performance, which count heavily in a commercial machine. These can only be ascertained by actual use on the airways, but unless some unforeseen and unforeseeable drawback comes to light, the D.H.29 should mark a real milestone in commercial aeroplane design, and Captain de Havilland and those associated with him deserve well of the aviation world in general for their courage in trying out the experiment. At present two of the D.H.29 monoplanes have been built. One of these was for the Air Ministry, and may not be referred to here. The second machine is being fitted up for commercial work, and is the one which forms the subject of the present description. The first impression one receives in looking at the 29 is that the wing area is totally inadequate. This is, of course, due to the fact that a thick section high-lift wing is employed, which has a high Lc max. and thus gives the same landing speed for a much higher wing loading. It is a curious fact that the wing area of the monoplane is practically the same as that of the D.H.4, which was quite a small machine, while the monoplane carries 12 people, 10 passengers inside the cabin and a pilot and navigator outside in front. When once one has become accustomed to the somewhat unusual appearance of the machine, she looks very pleasing indeed with her substantial fuselage and sharply tapering wings. The De Havilland "29" commercial monoplane, a 12-seater fitted with a Napier "Lion." Under the left wing tip may be seen Captain de Havilland and his chief engineer, Mr. Walker. THE D.H.29 MONOPLANE: Side view. 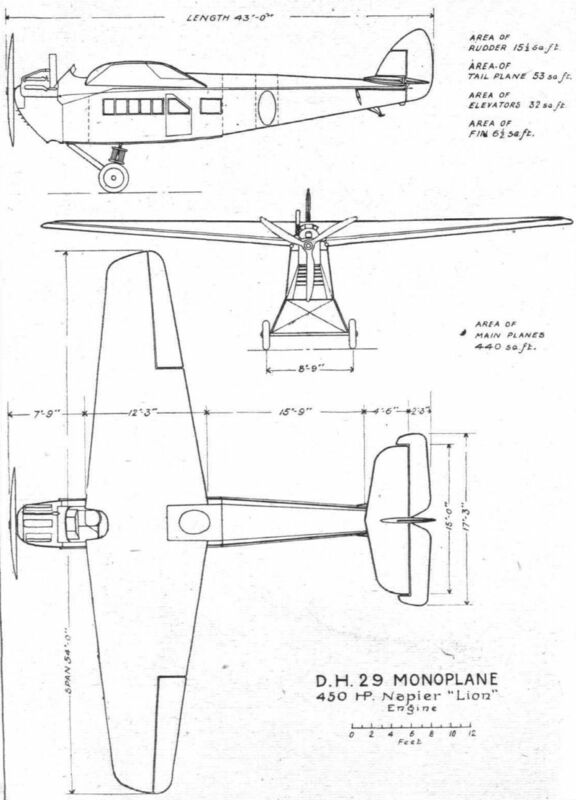 THE D.H.29 MONOPLANE: Three-quarter rear view. The tail shown in this photograph has been slightly altered, the elevator having horn balances projecting past the end of the tail plane, as shown in the plan view of the general arrangement drawings. THE NEW DE HAVILLAND MONOPLANE: Two views of the machine in flight. The photographs are published by permission of the Air Ministry, but no technical details may be given. The De Havilland "29" Monoplane paid a flying visit to Croydon on Monday. FROM THE AIR CONFERENCE VISIT TO WADDON: The picture shows visitors inspecting the machines lined upon the aerodrome. FROM THE AIR CONFERENCE VISIT TO WADDON: The photograph gives a good idea of the different types of machines on view. Vickers "Vimys," "D.H." monoplane, and several types of "D.H." biplanes, Bristol Ten-seater, Farman Goliaths, etc. 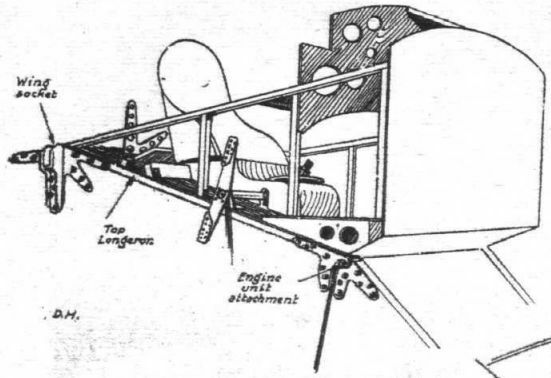 The D.H.29 Monoplane: Sketch showing Engine mounting, which is a detachable unit. THE D.H.29 MONOPLANE: The Pilot's Cockpit is placed above the top of the Fuselage and just in front of the Wings. THE D.H.29 MONOPLANE: The ailerons are given a differential action by having the arms of the rockers of unequal length. A steel tube runs from the rocker to the aileron crank. 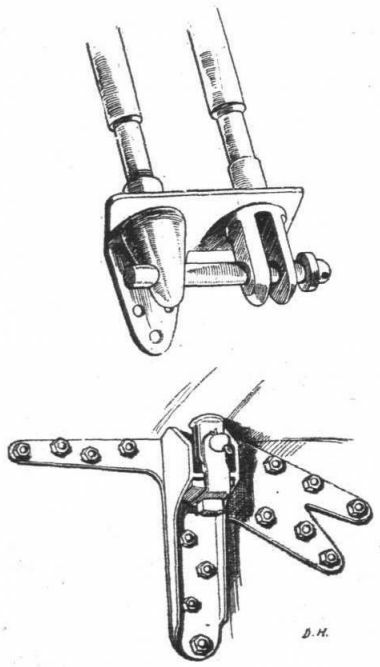 THE D.H.29 MONOPLANE: Details of the fitting which secures the wings to the top longerons of the fuselage. THE D.H.29 MONOPLANE: 1. The steel tube which runs from the transverse shaft to the elevator crank is provided with leather protectors. 2. Steel rods are employed wherever the control cables have to pass through guides. 3. A spring loaded setting of the elevator takes the place of the usual trimming tall plane. SOME WING DETAILS OF THE D.H.29 MONOPLANE: 1. Location of the Starboard Petrol Tank. 2. 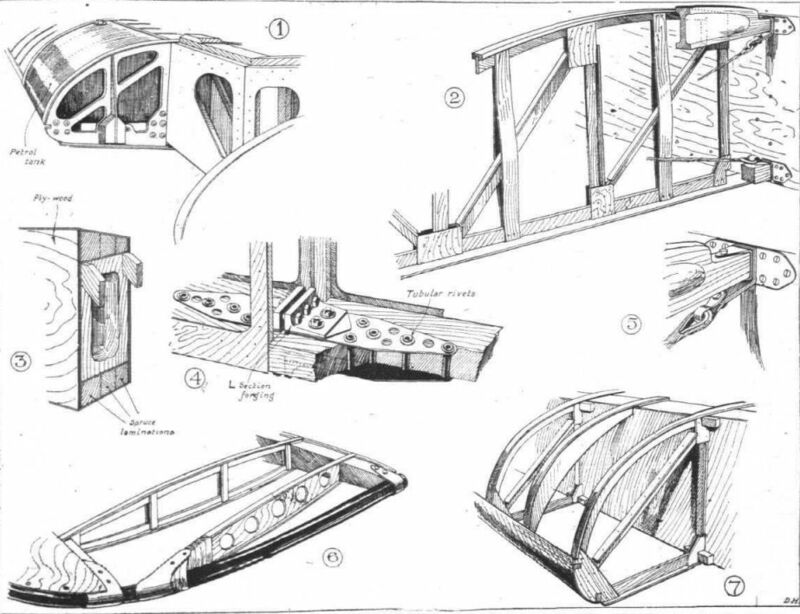 Details of Rib Construction. 3. 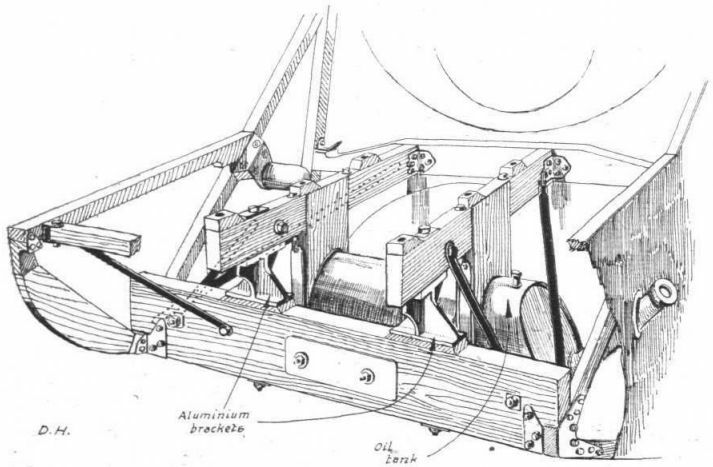 Sketch showing spar construction. 4. The two halves of the wing are joined as shown, by L-section forgings, steel plates, through-bolts and tubular rivets. 5. Compression strut attachment 6. The tubular wing tip and its attachment to spars. 7. 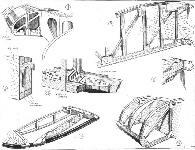 Construction of leading edge and nose ribs. 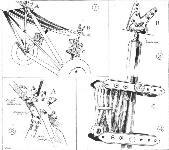 SOME DETAILS OF THE UNDERCARRIAGE OF THE D.H.29 MONOPLANE: 1. 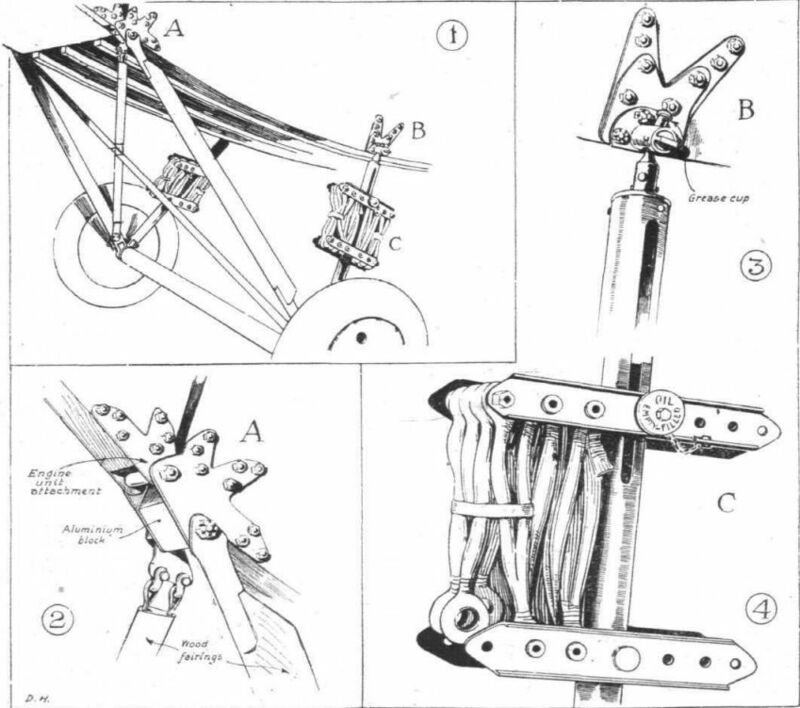 General arrangement of the undercarriage. 2. Details of the swivel attachment of the front chassis strut to lower longeron. 3. 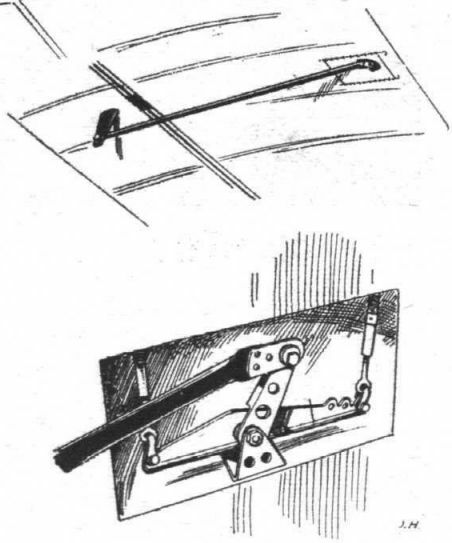 Ball-and-socket attachment of rear chassis strut. 4. Details of the rubber shock-absorbers and oleo gear. Note how the arrangement has been simplified as compared with that of the D.H.18.